MISSOULA — Former Montana football player Andrew Harris wasn't a star on the gridiron for the Griz, but his death has drawn reaction from across the state, the Big Sky Conference and the country. Harris, a redshirt junior from Kalispell, died Tuesday of what police believe to be a suicide. He was 22 years old. "Any time we lose a member of the Grizzly brotherhood, it's a sad day," Montana head coach Bobby Hauck said in a news release. "The Grizzly family will continue to mourn the passing of Andrew Harris, but right now our primary concern is for his immediate family, their well-being and their privacy. Our prayers are with them." Harris had played in 11 games for the Griz, including eight this past season when he moved to the defensive line. He finished the season with one tackle and 1/2 a sack. Harris is the son of former Griz Greg Harris (1971-75) and brother of former Griz Josh Harris (2008-12). "All of us in Grizzly Athletics were saddened to hear of Andrew's passing," Montana athletic director Kent Haslam said in a news release. "On behalf of our department and the more than 300 student-athletes here at UM, we send our deepest condolences and heartfelt thoughts to the Harris family and all those who knew and loved Andrew." The athletic department will observe a moment of silence for Harris prior to the men's basketball game on Thursday at Dahlberg Arena. A celebration of Harris' life will take place 1 p.m. Saturday at Canvas Church, 255 Summit Ridge Drive in Kalispell. Players, coaches and administrators from across the state took to Twitter to share their reaction to the news of Harris' death. "Never be afraid to reach out for help," wrote former player Griz Gage Smith, who retired from the football team because of anxiety and depression from concussions. "Too many people gone too soon. Prayers to the Harris family. RIP Andrew." "To anyone who is struggling with depression or any other mental health issue PLEASE KNOW YOU ARE NOT ALONE," former Griz and current San Francisco 49er Brock Coyle shared on Twitter. "You are NOT weak. It’s OK to ask for help, it’s OK to ask for love! Bc when you are loved you will never feel more alive. Prayers up to the Harris family." Former Griz running back Alijah Lee, who finished up his senior season, wrote: "This is news you never want to hear. My deepest condolences to the Harris family! Please, reach out to friends, family, or the National Suicide Prevention Lifeline (tel: 1-800-273-8255)." "Rest in Peace Andrew," former Griz player and current student football coach Caleb Lyons shared. "If you ever are feeling depressed and having life ending thought please reach out and talk to someone. God has surrounded every one of us people that love you. Even if it doesn't feel like it sometimes. We are here." Montana State athletic director Leon Costello tweeted: "Deepest sympathies to the Harris family @MontanaGrizFB @UMGRIZZLIES and @umontana. Our thoughts and prayers are with you during this time." 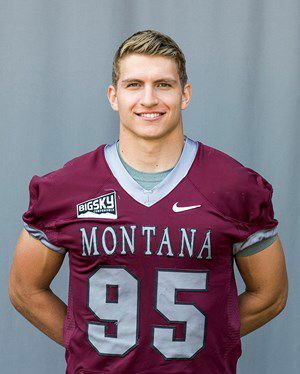 "Our prayers of strength and comfort go out to the family of Andrew Harris and the @MontanaGrizFB family," wrote Montana State-Northern head football coach Andrew Rolin. Our prayers of strength and comfort go out to the family of Andrew Harris and the @MontanaGrizFB family. Reaction to Andrew's death poured in from across the Big Sky Conference, too. "Sending our deepest condolences to Griz Nation as they mourn a tragic loss," former Griz defensive coordinator Jerome Souers, who recently retired as Northern Arizona's head coach, wrote on Twitter. "Our hearts go out to the family of Andrew Harris and all members of the Grizzly FB program." Sending our deepest condolences to Griz Nation as they mourn a tragic loss. Our hearts go out to the family of Andrew Harris and all members of the Grizzly FB program. Former Griz cornerbacks coach J.B. Hall, now in the same position at Sacramento State shared: "Praying for all my friends and family in Missoula. May the Lord be with the Harris Family and @UMGRIZZLIES during this time. Peace be with Andrew's brothers @MontanaGrizFB. Stay together! God is Love." "Very sad news for @MontanaGrizFB," recently hired Big Sky Conference commissioner Tom Witsrcill shared. "Our thoughts, prayers and love are with you. Another terrible reminder that we must care for and support each other. No one is ever alone...talk to someone! The Big Sky rallies around the Griz." Eastern Washington head coach Aaron Best, coming off a national runner-up finish, wrote: "Our hearts, thoughts and prayers are with the Harris family and entire @umontana family during this incredibly difficult time." Our hearts, thoughts, and prayers are with the Harris family and entire @umontana family during this incredibly difficult time. Sacramento State quarterback Kevin Thomson shared: "Saddened to hear about the passing of Andrew Harris this morning. My thoughts and condolences go out to his family and the entire Montana football team and staff. Let's all continue to to (sic) be there for one another and support eachother (sic) every way we can #RIP95." "Never know what others are going through.. be a helping hand whenever you can, life is way too short," wrote Northern Arizona safety Anthony Sweeney. Tweets also appeared from Twitter accounts of the Big Sky Conference and several league athletic departments and individual teams. Harris' death reached others around the country. "So sad to hear about the passing of @umontana football player Andrew Harris," University of Richmond football coach Russ Huesman shared on Twitter. "Our thoughts and prayers are with the Harris family and Montana football family." So sad to hear about the passing of @umontana football player Andrew Harris. Our thoughts and prayers are with the Harris family and Montana football family. The NCAA's Twitter accounted shared: "We join the University of Montana in mourning the loss of Andrew Harris. Our thoughts are with his family, friends and teammates." A player in the Women's Professional Lacrosse League, Kathy Rudkin, shared her thoughts related to Harris' death, writing on Twitter: "My thoughts are with all of the loved one of Andrew Harris. Mental health struggles amongst college athletes are a huge reality in our society. I pray for all those who are hurting now. It's okay to be vulnerable, it's okay to ask for help." News of Harris' death was shared by Reddit on Tuesday night and was picked up by the Washington Post, Sports Illustrated, USA TODAY, Yahoo and Bleacher Report on Wednesday. Per the athletic department, counseling services and other resources are available to all University of Montana students, student-athletes, faculty and staff seeking counseling during this difficult time. For crisis after hours you can also contact the Emergency Room at St. Patrick Hospital or Community Medical Center. If you or someone you know is struggling with depression or suicidal thoughts, please call the National Suicide Prevention Lifeline at 1-800-273-8255. They are available to help 24 hours a day, seven days a week.